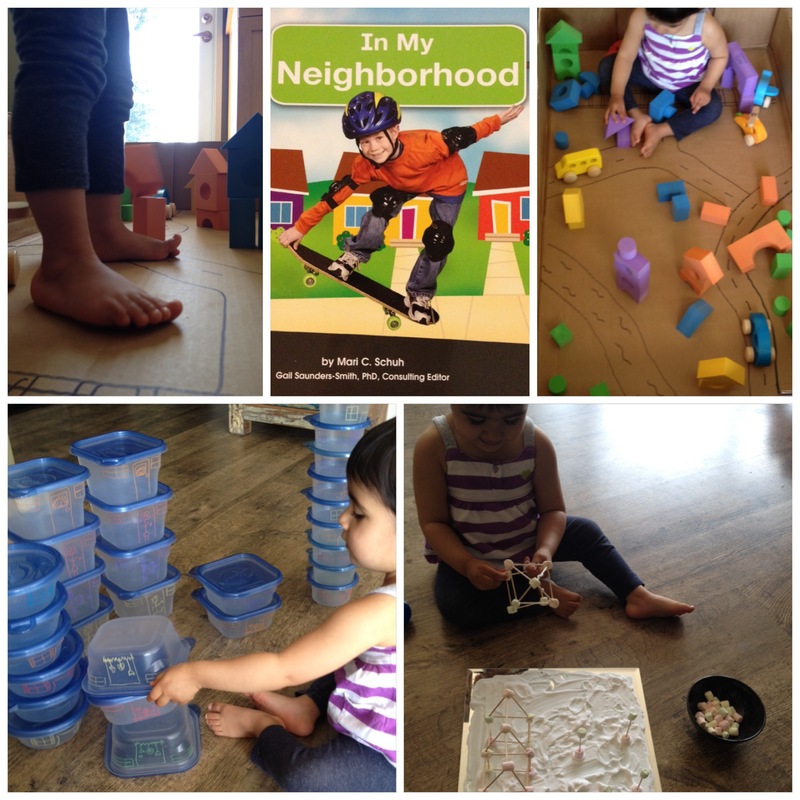 In My Neighborhood by Mari C. Schuh – In my neighbourhood is an informative book about different places you will find in a neighbourhood. It fit perfectly with our building activities for the day. I used this book during our Communities unit with my Kindergarten and Grade 1 students. It provides a lot of information about the people and places you may find around town. 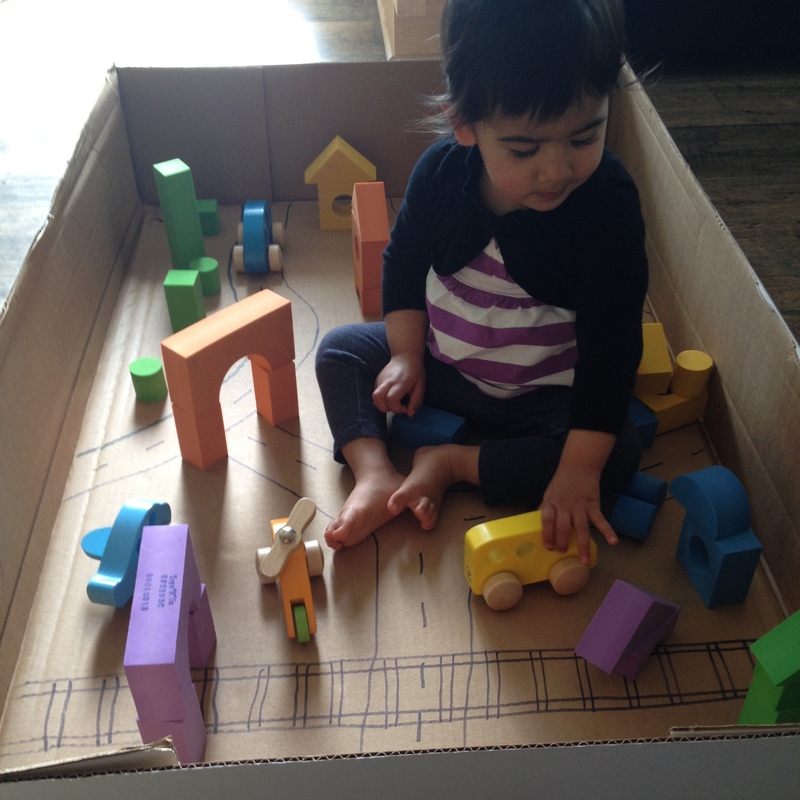 I made a neighbourhood in a large cardboard box using soft blocks and R’s toy vehicles. Using black permanent marker, I drew on some roads and a railway line to encourage R to move the vehicles through them, but she did as she pleased! Sometimes she’d topple the buildings down and other times she’d build them back up. She enjoyed slamming the vehicles into the buildings and toppling them over, the most. a. Put photos of different homes and buildings along the inside panels of the box to stimulate curiosity in building structures and shapes and to provide some inspiration for the child. Offer the child the following open-ended question to spark critical thinking: How does a house look different from a store or building? How can you show the difference? Have the child use the soft blocks and any other materials s/he needs to make different structures in their town. b. Encourage Writing. Have the child label the different structures around town. Encourage the child to write as many sounds as s/he hears. The child may be able to write just the first letter (and that’s totally fine!) or more. This is exactly what it sounds like. I used window markers to add details to the Tupperware such as doors, windows, people and gardens. R loved knocking the towers down and imitating the way I say, “nooo” as the towers toppled. 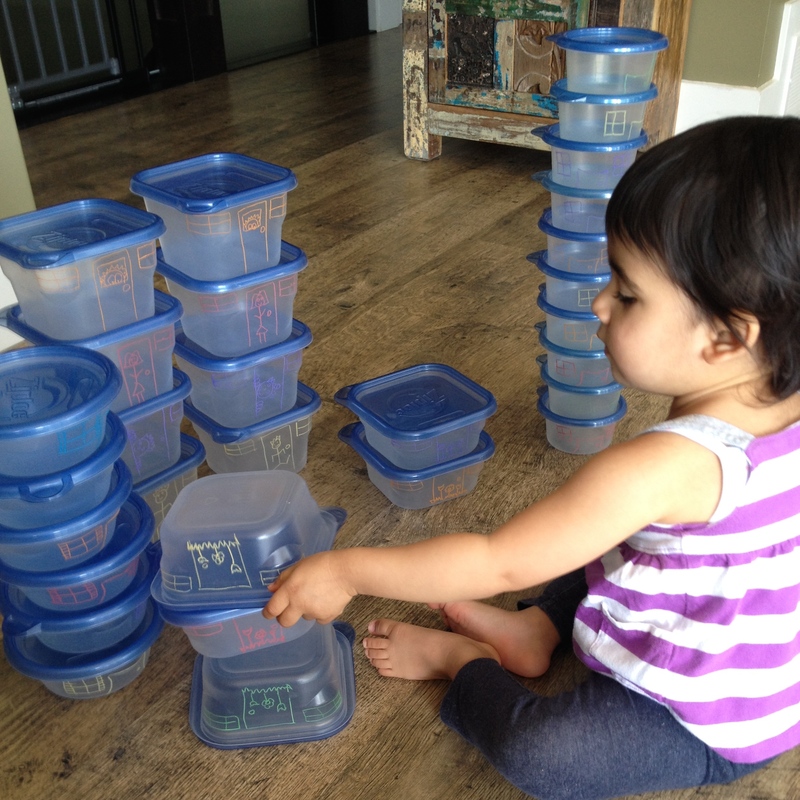 She works hard to stack multiple items on top on one another. She also likes to say the word “stack” as she is doing it since I used to use the word with her all the time when she stacked with blocks. a. Have the child draw on details him/herself before stacking. Talk with the child about what features would be important to include. Ok so we didn’t literally shave marshmallows. Instead, I created a winter landscape with shaving cream and added marshmallow and toothpick sculptures. I used the command “poke” to encourage R to poke the toothpicks into the marshmallows. 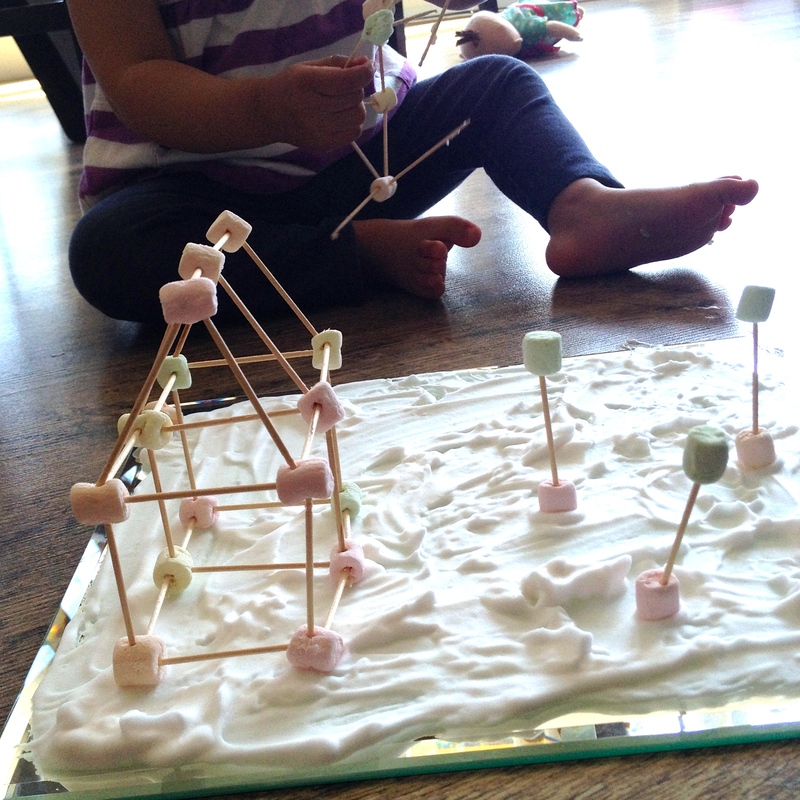 She, of course, can’t build sculptures yet, but she enjoyed poking the marshmallows with toothpicks and pulling apart the structures. a. Make different 3D structures with the child. Talk about vocabulary words such as edges, faces and vertices. b. Problem Solve with older children. Ask the child the following open-ended question: which 3D shape will support the most weight? Have the child make predictions and then experiment to test his/her hypothesis.